There's nothing easier than throwing on a dress and a jacket and then heading out. Ever since I bought this dress this summer (originally seen in this post), I have received nothing but compliments on it. I know I'm going to make this dress fall-friendly by layering. One easy way is with a jacket like I did in this look. Or, I'll throw on a turtleneck underneath the dress and tights with heels or fun boots. I love making pieces in my closet as versatile as they can be. Do you do the same? from H2T this whole look is perfect! we want one of everything!!!! such a pretty look! love the yellow detail on the jacket! thx for ur comment, u just got a new follower! 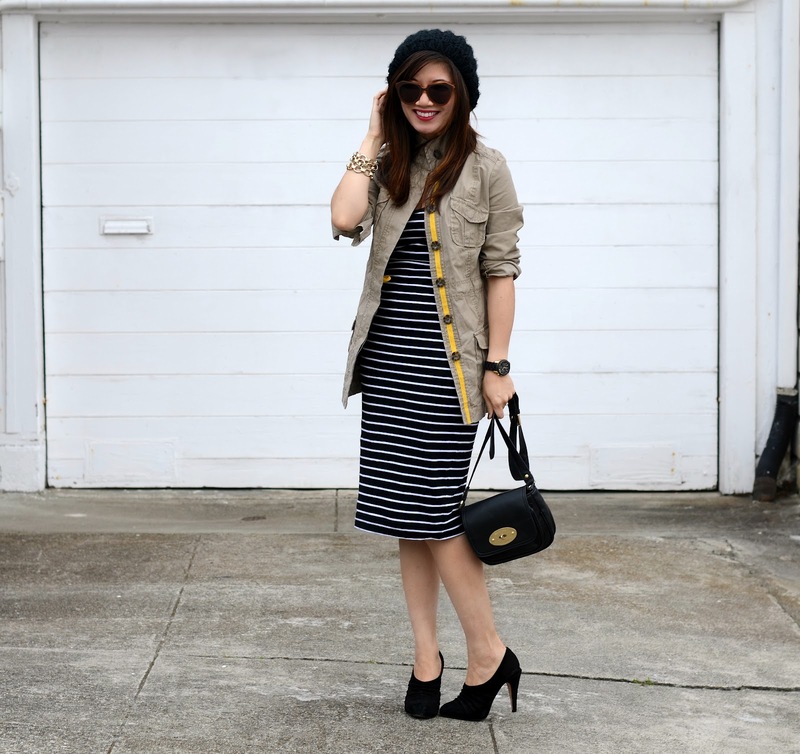 That jacket is a really nice twist on the trench coat. Love it. i see why you get so many compliments on it. you look fabulous! You always look so chic!!!!! I love the dress and those shoes! Jackets and dresses, my fav!!! The best part, both pieces are great separately too. Nice outfit. :) Cheers from Milan. 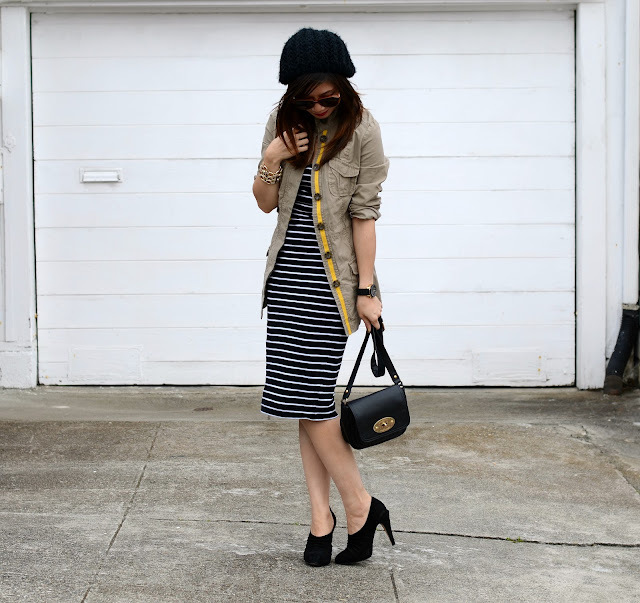 I love this jacket over a dress! And the length of that dress is perfect! It looks great with your booties! There's nothing better than a versatile piece :) Love the little pop of yellow! That dress is SO cute, and it looks awesome with that jacket! I love that dress and how you made it so Fall appropriate! I'm so in love with that dress! And your outfit :) Everything always looks great on you! Love the cut of these shoes, they're like half heel half bootie! your outfit looks amazing *_* i really like the outfits on your blog. can we follow each other? keep in touch! Oh,I love this outfit! Everything looks great together! that dress was a total score, for sure! Love this, I would have never thought to put those two things together, and I love love love the dress! That dress does look fabulous on you and I can see why you get so many compliments! I keep staring at that jacket every time I go into Old Navy but I have yet to try it on. I'm definitely going to try it on next time I go in! This outfit is perfection on you!